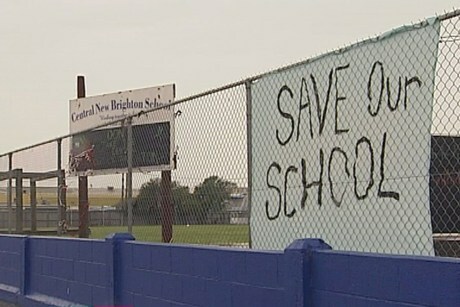 Primary school teachers in Christchurch voted in late January to carry out a political strike in opposition to the government’s decision to close 11 Christchurch schools and put a further 24 schools through mergers. Teachers, parents, and school children want earthquake damaged schools fixed and reopened. A clear majority of teachers voted for the strike action, the vote was carried with 83% in favour. As well as opposing the closures and mergers the teachers are campaigning against the introduction of charter schools and the continued use of the double-bunking system. Double-bunking refers to the practice of teaching different groups of students in the same classrooms at different times. Double-bunking was used in Christchurch to facilitate classes when schools were damaged by the February 2011 earthquake. Teachers intended for double-bunking to be an interim solution. It leads to classes being held in anti-social hours, which is negative for school children and teachers alike. In a poll published by The Press 66% of people felt that the closure and merger process has been handled very poorly by the Ministry of Education and 19% felt that it had been handled poorly. Only 1% in the survey felt the process was handled well. A New Zealand Education Institute (NZEI) branch chairperson and teacher said that the support provided to children by teachers after the February 2011 earthquake is recognised by Christchurch parents and communities and is one of the reasons for the popular support that teachers are receiving. The NZEI says that the government has failed to properly consult teachers. 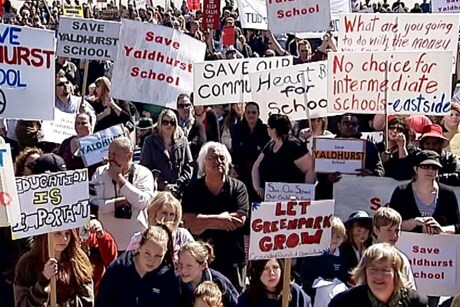 Both teachers and Christchurch communities have had little or no chance for genuine consultation over the government plans. In the same survey (as reported above) 43% of people were not at all confident that the consultation would improve the final outcome and 31% were not confident. The future of schools, jobs, and children’s education will essentially be dictated by the Ministry of Education. The strike is set to take place on February 19, which is the day after Education Minister Hekia Parata is set to make the government’s announcement regarding the fate of each school. The lack of consultation with teachers, parents, and the public raises broader questions about democracy and how decisions are made. Governments with a parliamentary majority should not be free to dictate terms to communities. The government should be denounced for not engaging in any meaningful consultation. But that is only a starting point. The mood in the community is such that it’s possible to raise slogans for collective control of decision-making through committees of parents, teachers, and supportive local residents at as many schools as possible. Even if such an approach is unable to wrest decision-making from the government, the formation of such committees would be required to form the basis of a fight-back against closures at individual schools. When the strike action was first suggested by branch members in December 2012 the education ministry pointed out that the strike would be illegal. The union leadership, to their credit, did not shrink from the decision to strike. The potential illegality of the proposed strike was reported in the media and expert opinions were published. But the legality of strikes in New Zealand is not a complicated question. New Zealand is among the countries with the most restrictive strike laws in the developed world. In many countries workers are able to strike over individual matters (such as unjustified dismissals), or in solidarity with other striking or locked-out workers, or for political purposes. In New Zealand, as codified by the Employment Relations Act, workers cannot strike for any of those reasons. Strikes may be carried out legally only when in bargaining for a new collective agreement and for the purpose of achieving the settlement of that agreement. The restrictive anti-strike laws increase the power of the government and employers.With the full knowledge of the illegality of the strike the teachers have continued to proceed along the line of taking industrial action. This is a significant development given that there have been very few strikes that have genuinely challenged the anti-strike laws. It shows the determination that the teachers have to defeat the government’s agenda. In mid-2012 teachers forced the government to back down on proposed student-teacher ratios that would have resulted in staff cuts. This was a great victory that dented the government’s confidence in its fight against teachers. The pay service failures – which have resulted in some teachers not being paid for weeks or months – have also put the government on the back foot. But it is likely that to remain credible and maintain its legitimacy the government will not back down again without a serious fight. If the government backs down again without a fight it will risk opening the floodgates for other social demands that it doesn’t want to pay for in the education sector, in the Christchurch rebuild, and elsewhere. To be successful the teachers will have to remain vigilant especially as pressure mounts from the government and the right-wing to withdraw the strike action. 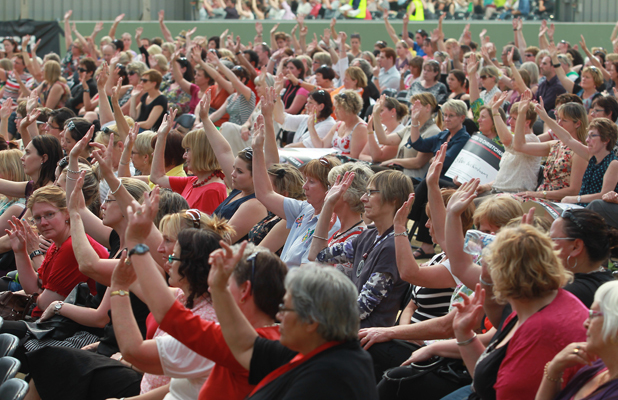 Ultimately, in order to win, the teachers will have to call on other teachers – outside of Christchurch – to join the struggle by carrying out solidarity actions and spreading the strike action. It is also in the direct interests of teachers outside of Christchurch to use industrial methods to fight the introduction of charter schools. The inspirational stand of the Christchurch teachers should be replicated nationally. The preparedness to organise and fight that is being shown by the teachers, coupled with high levels of public support are the pre-conditions for a successful campaign. A victory will be possible if organisational tasks and strike actions are intensified and expanded. Supporters of capitalism are always concerned with persuading ordinary people that democracy merely consists of voting-in a new government every three years (or whatever the frequency in a given country). In terms of ‘free and fair’ elections New Zealand has a relatively strong level of democracy. However, the lack of public decision-making around the Christchurch schools helps to show that democratic socialism is needed. Additional to participating in national and local elections, ordinary people should be able to democratically direct other aspects of everyday life including workplaces, schools, and community organisations. Absolutely agree – this is the time for teachers to stand together for education, not just in Christchurch(but importantly so) but in NZ. If we vacillate then our world class education system will be gone – if this is not worth fighting for what is?